Am I a Candidate for Snap On Smile? How long does it take to get a beautiful new smile? If you are a candidate for Snap On Smile, you may have a brand new smile in just a few short dental visits. Our Los Angeles snap on smile dentist can rejuvenate and revitalize your smile without any drilling, painful procedures or waiting. Snap On Smile is a revolutionary dental product that can restore or enhance the appearance of discolored, chipped, worn, cracked, damaged and even missing teeth. It is made of the highest quality dental resin and offers a fast, pain-free, simple way to achieve a more attractive smile. The removable appliance is designed to attach to your teeth similar to a retainer. It can be easily worn and removed, but they are strong and secure enough to allow you to continue your everyday activities, including eating, with confidence. Just one trip to our expert in snap on smile in Los Angeles will have you on your way to a brilliant new smile. Dental impressions will be taken, and you will be able to choose from more than 20 shades and nearly 20 different smile designs. Once you have made your choice, your impressions will be sent to the Snap On Smile laboratory, which crafts your new smile. In just two weeks, you will be ready to wear your new smile. You will need no preparation, no alteration of your natural teeth, no painful shots and no adhesives. The patented design of Snap On Smile allows you to restore, enhance or perfect your smile without any time-intensive or invasive procedures that permanently alter your teeth. Although Snap On Smile is affordable, easy to use and versatile, it may not be the best choice for every patient or every situation. Our Los Angeles snap on smile dentist can help you determine if Snap On Smile is right for you. 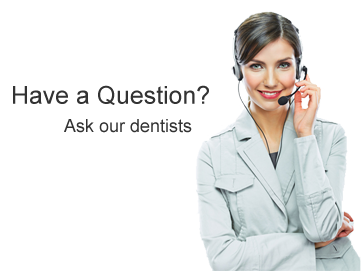 Our expert in snap on smiles in Los Angeles has helped many patients achieve attractive, confident smiles. We can help you, too. 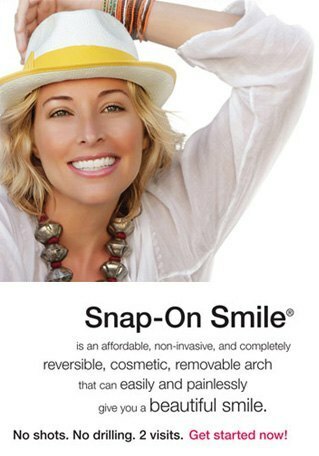 Give our office a call today to learn more about Snap On Smile or to schedule your consultation. © 2014 SnapOnSmile-LosAngeles.com. All right reserved.